In recent years, policy debates, civic projects, and civil contestations rooted in the critique of contemporary urban development patterns have arisen over the use of city space, urban social infrastructures and culture. Cities all over the world are promoting policies aimed at finding innovative solutions to the most urgent urban issues, including large scale urbanization processes, social and economic inequalities, socio-spatial polarization, the need of sustainable urban planning, equitable access to technology, and CO2 emission control. The international community, supported by global public organizations, debated and agreed in the New Urban Agenda and the Sustainable Development Goals, providing policy guidelines to urban authorities and stakeholders. A growing number of public intellectuals, as well as civic and social movements have been charging public institutions with commodification of collective resources ranging from open squares, parks, abandoned buildings, vacant lots, and roads to digital infrastructures and networks, while reclaiming access to urban space and assets and control over the decision-making process about the management and evolution of the city for a broader class of residents. It has been a long path towards the right to the city (Lefebvre 1968), recently re-emerged in the international political scene (Harvey 2012), and often conceived as broader theoretical and ideal framework of urban justice and democracy (Ooman 2016), where the empowerment of citizens to shape their living space by expanding access to collective resources find place as the concept of urban commons. By arguing that there is a common stake in resources shared among city inhabitants like open-access urban spaces and goods they experiment with alternative policies and legal tools, designed for making such resources available also for the most vulnerable and disadvantaged groups of inhabitants. The pluralistic conception of the commons provide us with a well-founded framework for making our urban metropolitan environment more inclusive, democratic, and collaborative. Ultimately, we theorize the cultural shift from single, isolated commons to the city itself as commons, which means that the commons should be a leading way of thinking how to govern the city. Despite the vast literature on natural resource commons, we found the urban commons to lack an adequate understanding and took up the challenge of shedding light on what are the peculiarities of common-pool resources located in complex, congested, and heavily regulated urban areas and how they can be successfully managed through new forms of democratic experimentalism. The analysis of various kinds of institutional arrangements and local governance practices already in place or in the process of being experimented, allowed us to adapt Ostrom’s design principles for the governance of common-pool resources to the urban commons management structures and suggest some tailored policy tools to all actors (i.e.  social innovators, public authorities, businesses, civil society organizations, and knowledge institutions as shown in the “quintuple helix” of LabGov’s logo) willing to access the polycentric co-design processes. In the new city governance model we propose — what we call “urban co-governance”— the city (as public authority) acts as a facilitator of the emerging co-management structures throughout its territory and enables city inhabitants to actively take part in the regeneration of their habitat, improve their lifestyle, and develop the community they belong to. In this way, LabGov practices and advocates for the transitions from urban commons intervention to a more just and democratic governance of the city as commons. The Co-City Protocol comes out of the field-experiments designed, analysed and interpreted by LabGov in several Italian cities, together with 200+ global case studies and in-depth investigations run in more than 100 cities from different geopolitical contexts. From this multi-year research project known as Co-Cities LabGov extracted a methodology aimed at serving as guidance for urban policy makers, researchers, and urban communities involved in co-governance experiences. It focuses on urban commons transitions, including patterns, processes and public policies where local communities committed to sustainable urban growth and fair resource management play a key role in partnership with other political, economic and institutional actors. 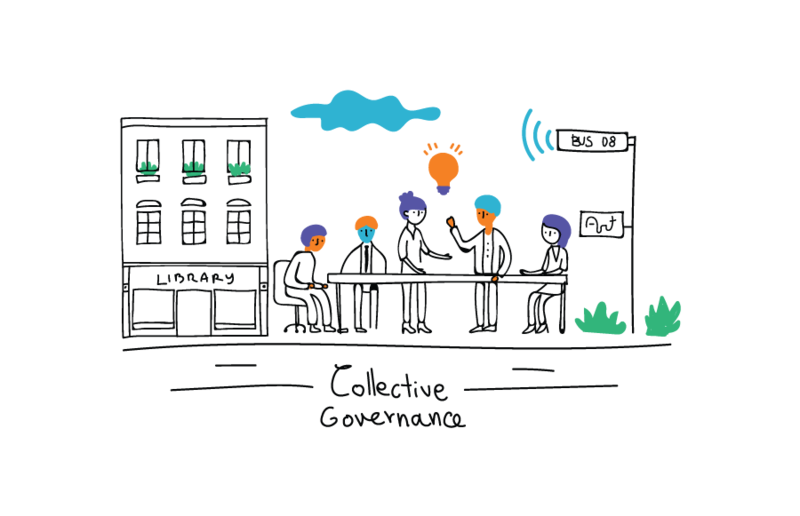 The concept of the Co-City situates the city as an infrastructure enabling cooperation, sharing, and participatory decision to peer production, supported by open data and guided by principles of distributive justice. A Co-City is based on urban collaborative, polycentric governance of a variety of urban physical, environmental, cultural, knowledge and digital resources, which managed or co-owned through contractual or institutionalized public-community or public-private-community partnerships (the so-c commons). The Co-Cities research project and protocol five design principles setting up conditions and factors necessary to rethink the city as commons: the inclusive space where various initiatives of collective action for the urban commons emerge, relate and become sustainable. This Protocol is now in the process of being tested in cities of the Global South, including San Jose (Costa Rica), Mexico City, and Accra. 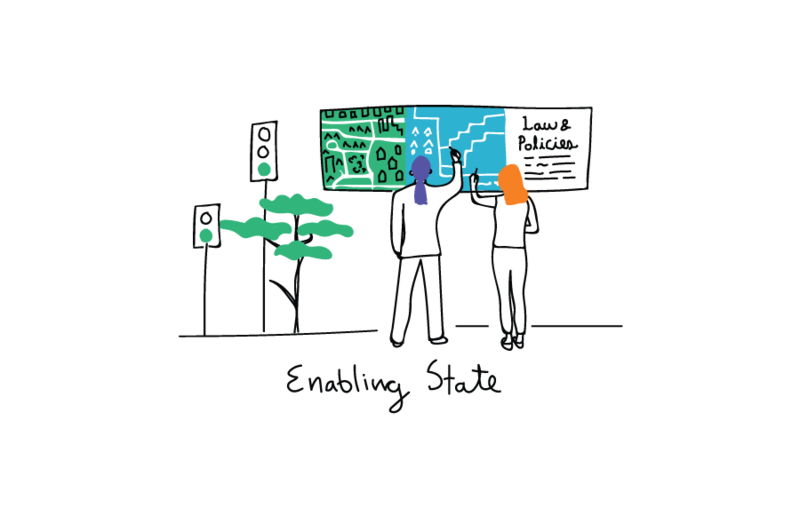 LabGov believes that the Co-City methodological approach will constitute an effective tool to design and stimulate processes of urban justice and democracy for cities in Least Developed Countries too. It represents an original and proactive approach to implement and monitor the achievements of global policies such as the New Urban Agenda and the Sustainable Development Goals especially the goal 11 for inclusive, safe, resilient and sustainable cities, and the sub-goals aiming at fostering participatory and representative decision-making and effective public, public-private and civil society partnership (16.7, 17.17). The Co-City approach being experimental and adaptable to different types of social and geographical contexts, can contribute to cities prosperity enhancing the capacity of local authorities and leveraging value of collaboration with local communities. The Co-City Protocol, which identifies the necessary conditions for the establishment of a polycentric governance of networked urban assets, is composed of the 5 design principles, the co-city cycle the and the tools. 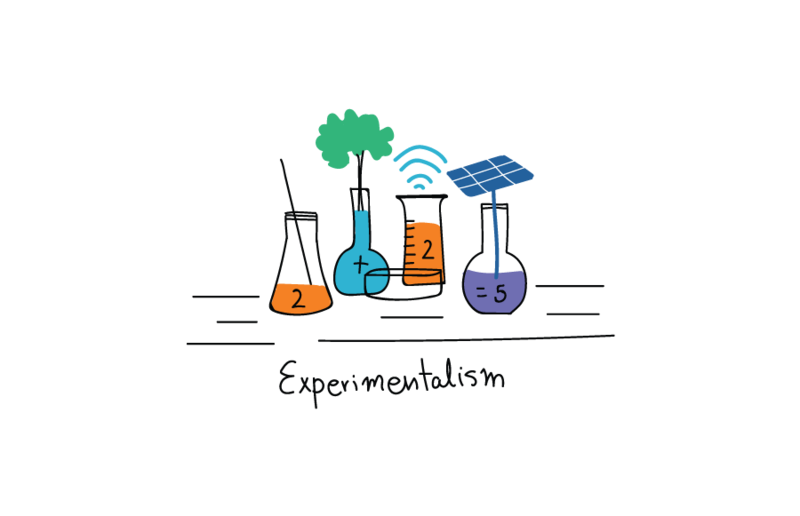 The five design principles are the necessary conditions that, at different level, allow the transition from urban commons projects to co-governance. This dimension refers to the presence of a multi-stakeholder scheme where the community (organized or not) emerges and partner up with public institutions and the private sector in the management of the urban commons. It expresses the role of the State supporting and making the collective urban management possible. It reveals the presence of autonomous institutions, managed or owned by local communities, operating within non-mainstream economic systems, such as collaborative, cooperative, circular economies, for the creation of new opportunities and services. This principle links to the presence of a site-specific and iterative bottom-up approach to design legal and policy innovations for the co-governance of the local urban commons. Open access to technological and digital urban infrastructure and data is an enabling driver of cooperation and co-creation of urban commons. This first phase deals with localizing urban commons and activating local actors (scholars, experts, practitioners) through dialogue interactions. It is carried out both offline and online, resulting in an analog and digital mapping of urban commons through relevant civic initiatives and self-organization experiences. Fieldwork activities, ethnographic work, as well as exploratory interviews or surveys are required during this phase. A core part is the collaboration camp where synergies are established between community-driven development projects and local authorities. The collaborative actors involved can be city residents, social innovators, knowledge-based institutions, nonprofit organizations, small and medium local enterprises or CSR programs, other public authorities, etc. This co-working session might be followed by a collaboration day with the objective of putting ideas into practice. At this stage, participants and policymakers infer from the previous phases the community-specific characteristics and needs which will be taken into account when co-designing and eventually implementing commons-centric governance schemes. Both qualitative and quantitative metrics are applied to assess whether the implementation of the policy prototype is consistent with the design principles and objectives. The evaluation methods need to fit local conditions and policy tools. Finally, the governance output already prototyped and evaluated is tailored to the city legal and institutional framework, by deepening urban norms, relevant regulations, and administrative acts. INSTITUTIONAL TOOLS – The institutional arrangement that allows the coordination and sharing of those resources, and helps to ensure their accessibility and sustainability for a wide variety of users, facilitating the evolution of the institutional ecosystem towards the city co-governance. 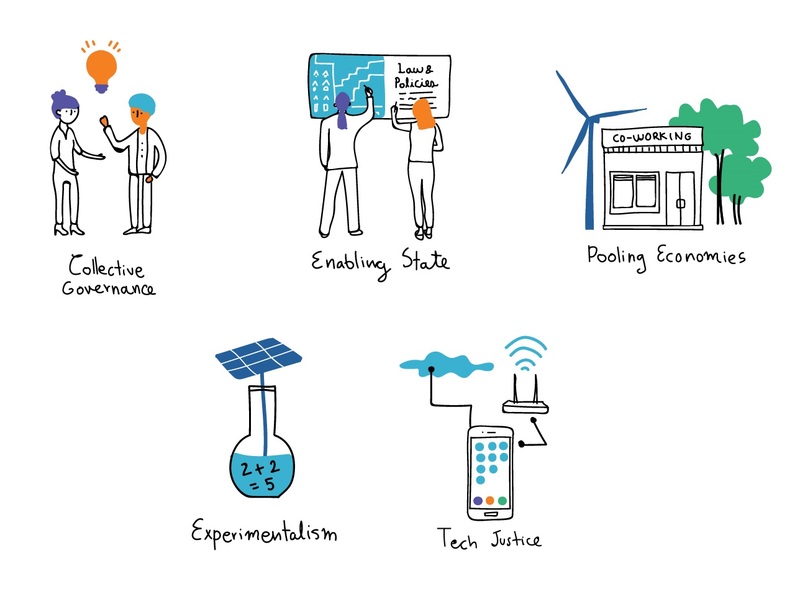 LEGAL TOOLS – To regulate the process of resource pooling, urban innovators can count on a set of legal instruments, that can be either contractual or institutionalized, which are often represented by partnerships established between at least 3 to as many as 5 different actors (see helix). 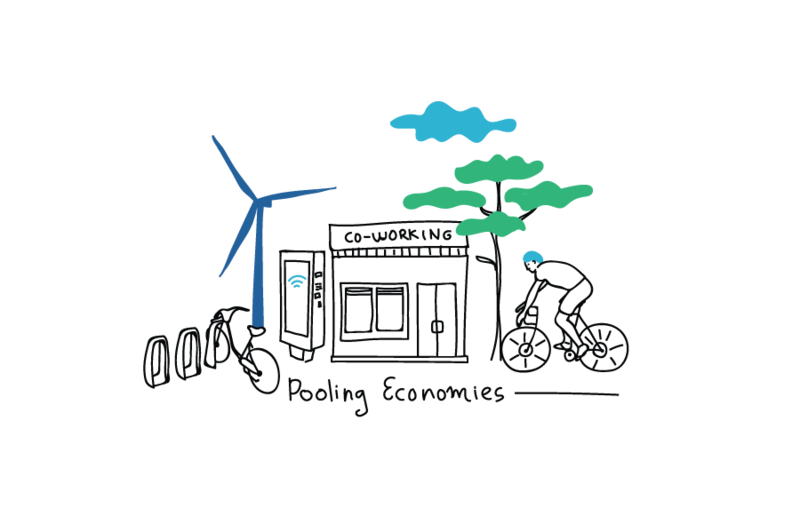 FINANCIAL TOOLS – The so-called “pooling economies” refers to the development of social projects’ financing for collaborative forms of urban infrastructure and urban services. They form around the collaborative economy and support the efforts of those city residents who partner with further stakeholders to cooperate for the general interest. DIGITAL AND TECHNOLOGICAL TOOLS – Technology lies at the heart of the “communing” experiences, as digital devices and tools are heavily employed to connect actors and make their collaboration possible. 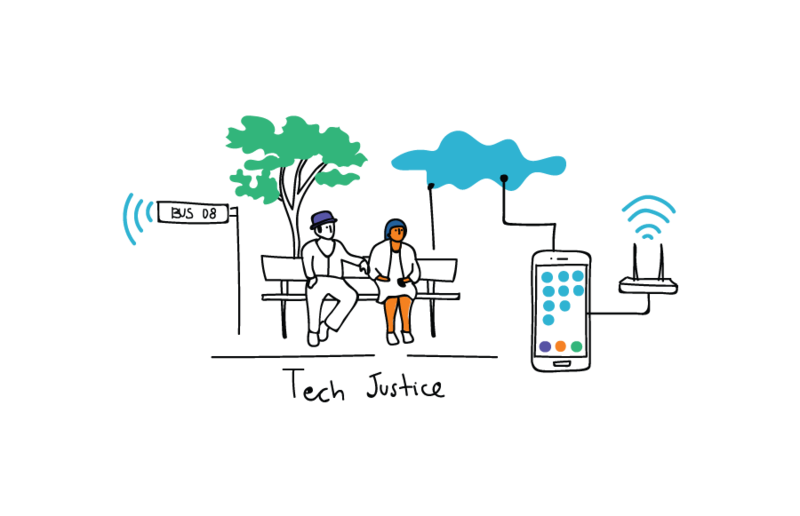 Reflecting the tech justice principle, digital means can help tackle inequalities and promote a broader access to urban goods and services enhancing social engagement and participation.